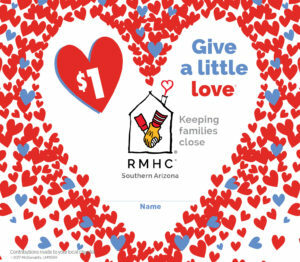 You might stop by the McDonald’s drive-thru on your way to work in the morning tomorrow, and the smiling face behind the window will hand you your much needed coffee as well as the chance to donate $1 to RMHC of Southern Arizona. You say, “Sure, why not?” Thank you! Every penny of that dollar stays here in Tucson to support guest families. Now we know not everyone will choose to donate, but let’s say that seven people total during the breakfast rush at that particular McDonald’s also choose to donate. Your $1 plus 6 others = $7. But that’s just breakfast. Let’s also say that the same happens at lunch and dinner too. $7 at breakfast, $7 at lunch, and $7 at dinner = $21. Remember, we said that this campaign will run for two weeks. $21 per day times 14 days = $294. That’s enough to support a family for three nights at the House. Amazing! All that starting from your $1. That means that your $1 donation played a role in over $15,000 coming to the Ronald McDonald House Charities of Southern Arizona in only 14 days. You have done your part in making sure that families will have a place to stay, a warm home-cooked meal, and reliable transportation when they are away from home because their child is sick – for over five months. More than 150 nights! Thank you to our friends at McDonald’s, and thanks to YOU. Because YOU make the difference in the lives of children like Olivia, like Mason, like Alexis. All this month, share your stories with us using #GiveALittleLove on our Facebook and Instagram pages.